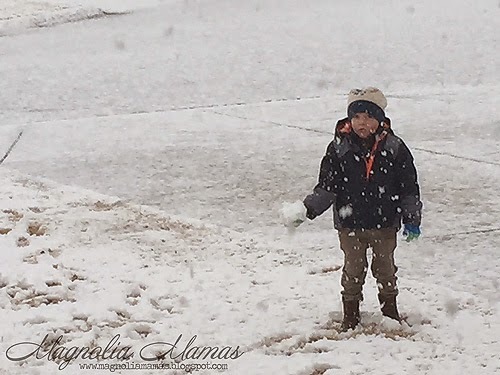 Magnolia Mamas : Snow Fun! Snow, snow, and wait for it...more snow. That has been the theme around here for the last few weeks. As Carrie Beth mentioned yesterday, the kids have been out of school for most of the week with on again off again snow storms. Yesterday the "big one" was supposed to hit with at least 6-7 inches in our area. We woke up this morning to maybe two. Whomp whomp. Still snow is such a novelty here, that kids have a blast playing in it no matter what the total amount of accumulation is. 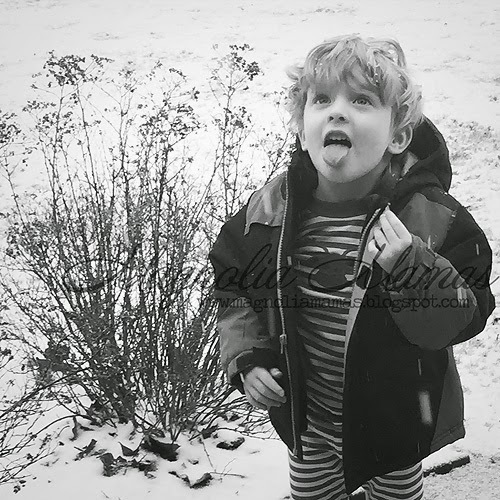 Wednesday morning we ran outside in our pjs to play in the inch or two of snow that dropped over night. We were so excited when it started to come down again. Cute must have heard somewhere that you eat snowflakes because he stood with his tongue out for at least ten minutes, and would squeal in excitement if one actually landed. 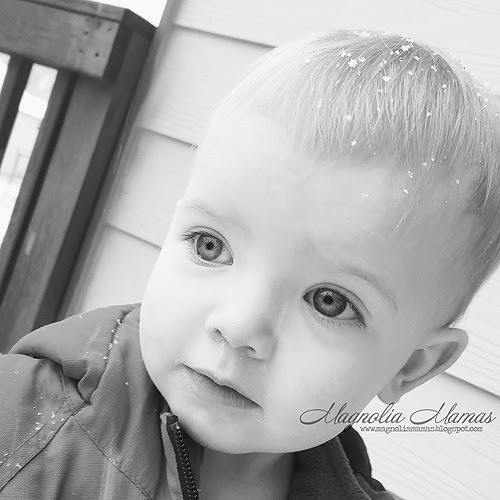 Little Cute wasn't sure what to think of the snow. She thought it was so silly when Cute and the Hubs built a mini snow man though. Cute wanted to build a snowman, and there was just enough snow to make a mini one on our back deck. He was so excited. Everyone meet Snowman Sammy. 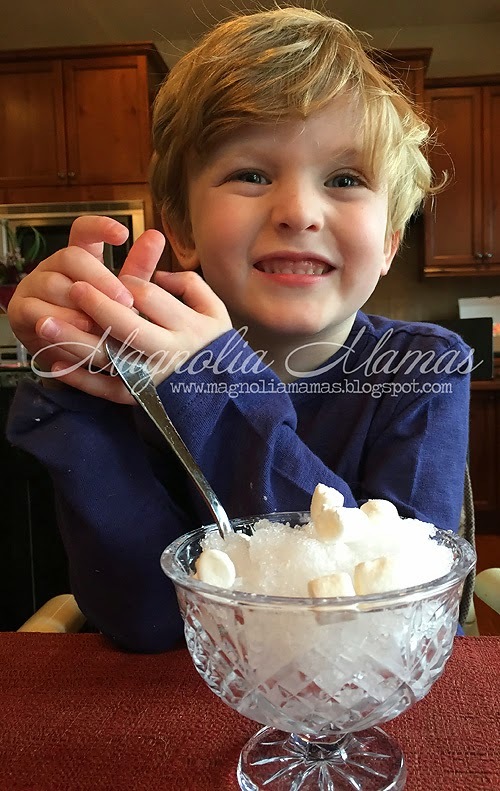 After playing all morning, when nap time rolled around, Cute and I decided to make the infamous snow cream we had read about. 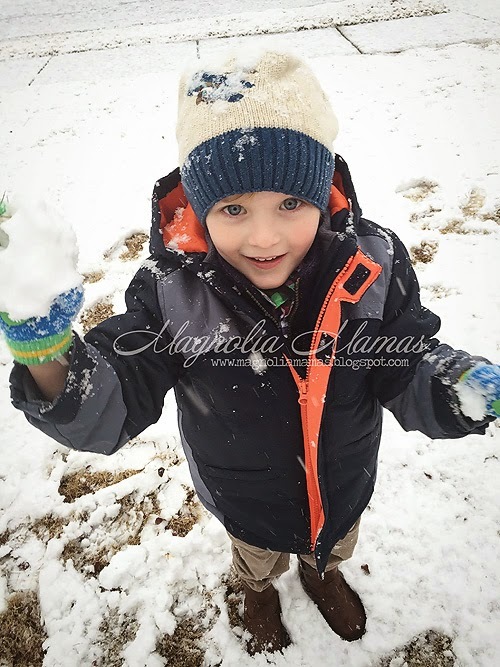 Then cute told me he just wanted to eat snow and marshmallows. He's not normally a big fan of ice cream so we decided to come up with our on concoction, and it was pretty tasty if I do say so myself. 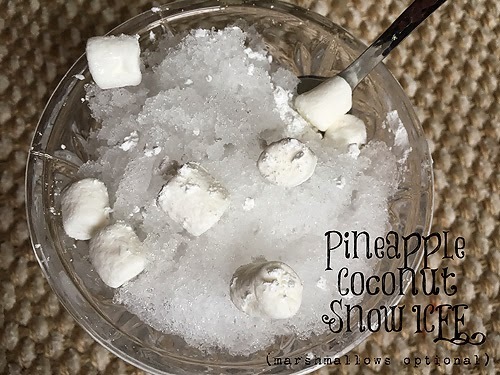 We ended up making something similar to flavored ice that you get in the summer. Cute then sprinkled marshmallows and powdered sugar on top so that it looked like "real snow". It was just enough flavor to make it fun, and my guess is you could do the same thing with any flavored juice and get the same results. Yesterday we woke up and made a mad dash to run errands before the "big one" hit. We were given a warning that around 2p.m. everyone should be off the roads. Our children took that warning as a challenge. They get it from their father. Cute broke out his "big bad" red Jeep for a little off road fun. Little Cute was clearly enjoying the ride. The Cutes woke up from nap and it was game on. 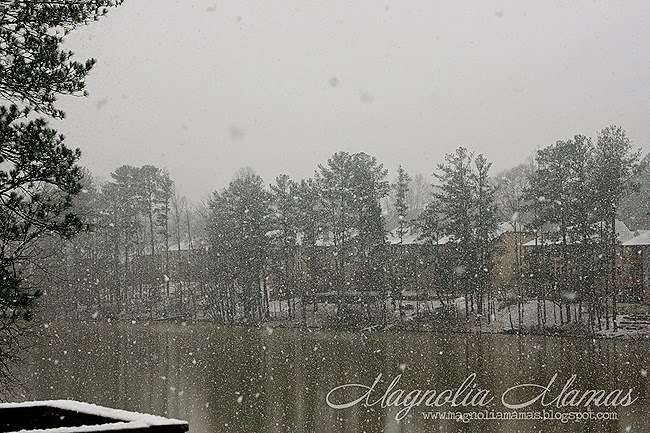 We went outside to play in the snow and it was still coming down in big fat flakes. By then we probably had a good 2-2.5 inches on the ground and it was more than enough to play in. 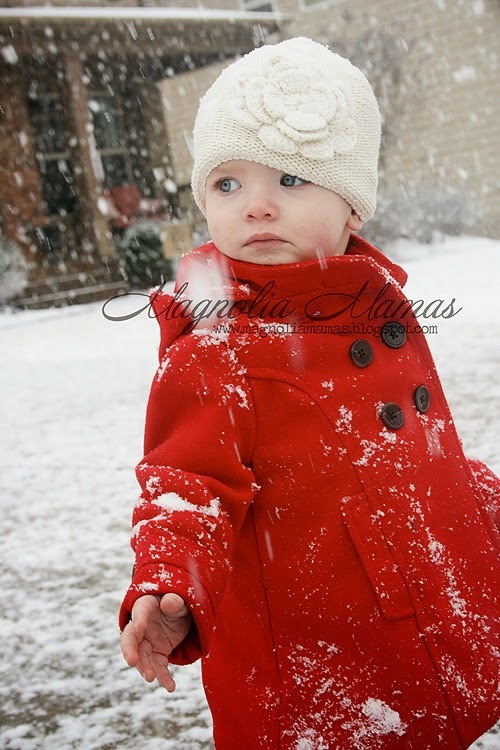 Little Cute still looked unsure of the snow and was not a fan of it hitting her in the face. Her time was shortly lived outside. 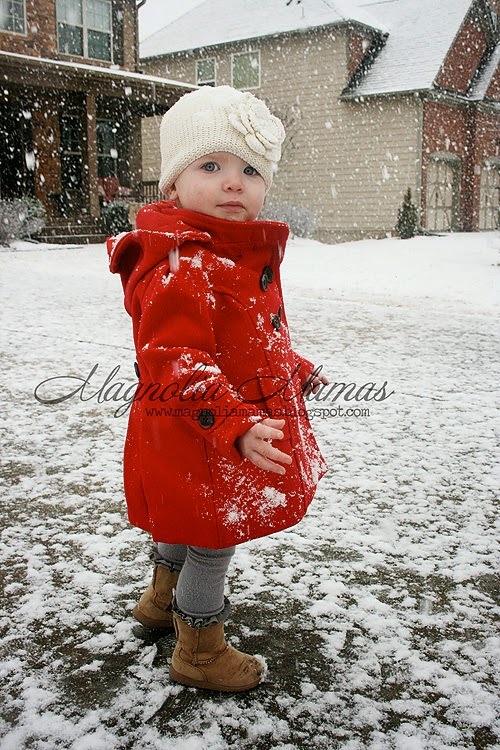 She was happier being inside looking out the window at her daddy and Cute throwing snowballs at each other. I can't blame the girl. She was much safer there out of the line of fire. Can't say the same for me as I was always seemed to be the target goal. Always. Cute LOVED the snow and only stopped playing with it to eat a brief dinner. He stayed out with the Hubs until it was dark and only came in with the promise of more snow today. Fortunately what little amount that did accumulate last night hasn't melted yet so I see a lot more snow fun in our day. After today though, winter can step on out because more than three days trapped in the house will make any mommy go a little stir crazy. No matter the amount of wine on hand.